The first probe to successfully reach the surface of another solar system body was Luna 2. Note that I say “successfully reach the surface of” and not “land on” because Luna 2 didn’t land on the Moon. Instead it was pretty much fired into it; when Luna 1 missed the Moon by 6000 km because of a mis-timed engine burn just hitting the target was seen as a success. There wasn’t a huge amount left of Luna 2 after the impact (or at least I assume so; it’s not like we can just send someone up there to check), but believe it or not the Soviets did actually intend for some of it to make it through intact. The rear-facing side of the probe contained several Soviet pennants as well as a small explosive charge designed to fire just before impact and slow the pennants down to the point where they wouldn’t be vaporized on contact with the lunar surface, so who knows? Maybe there’s a couple of burnt and twisted Soviet flags up there who have had to live for the last half century without the PR benefit of a full colour photo of Buzz Aldrin standing next to them. That’s a hard landing. The space race demanded that one or the other of the competing nations eventually perfect a method of soft landing whereby the landing craft (and the occupants) made it through intact. The Americans plumped for the method documented on here last week, testing it extensively with their Surveyor series of lunar probes: a retrorocket fired to slow the Surveyor craft down from orbital velocity and the descent was handled automatically by attitude thrusters and doppler radar. It might sound sophisticated compared to the Soviet efforts, but it was far from perfect to begin with as two of the seven Surveyor spacecraft (unintentionally) crashed into the moon. Still, as a method of prototyping the lunar lander mechanism the Surveyor program was a great success and contributed immensely to all twelve Apollo astronauts that actually landed on the moon getting back alive. NASA was taking things comparatively slow and steady compared to the Soviets (although they too fired a bunch of Ranger probes into the moon in 1964 and 1965 so it’s not like celestial target practice was a purely Russian conceit). After a frenetic series of failed attempts – likely because they were trying to beat the Surveyor program which successfully touched down later the same year and so weren’t fully testing everything – the Soviets got Luna 9 to make a soft landing on the Moon in 1966. 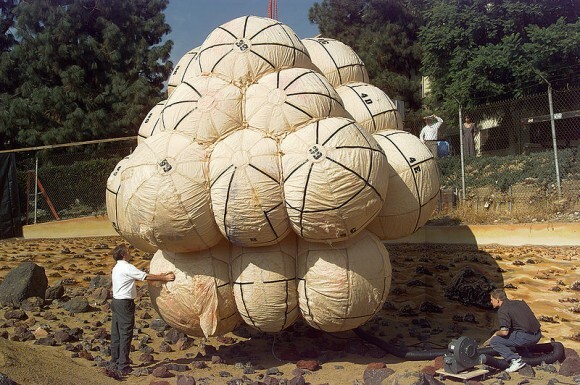 This pioneered the landing bag method whereby a huge bag inflated just before impact to cushion the spacecraft and slow it down to the point where it could survive the landing, just like the airbag in a car. Sounds a bit crude, but more refined versions of the concept are used in pretty much every single probe that lands on Mars these days; the picture above is the Pathfinder landing bags being tested, although they’re much smaller than Luna’s as Pathfinder also had the benefit of a parachute to slow it down. That’s how you land on the Moon. It’s both easier and harder than landing elsewhere because the lack of atmosphere preclude the use of parachutes/other atmospheric maneuvers while simultaneously allowing very efficient RCS systems to control descent. 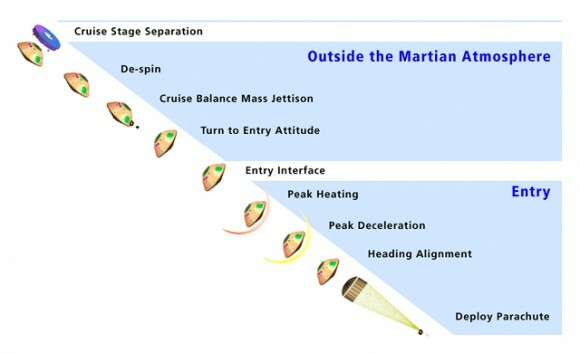 Landing on Mars is a pretty well-worn path thanks to the Viking and Pathfinder landers, the Spirit/Opportunity/Curiosity rovers and so on; thanks to the relatively forgiving environment they all use the same method of protecting the payload in an aeroshell, slowing descent using parachutes and then cushioning the landing with airbags. But what if we want to go somewhere a little more… exotic? During descent, heat dissipation and deceleration were accomplished sequentially by protective hemispheric shells, three parachutes, a disk-shaped drag brake, and a compressible, metal, doughnut-shaped, landing cushion. And even then the longest a Venera probe ever lasted on the surface of Venus was just short of two hours before it succumbed to the hellish environment and stopped transmitting. Now Venus is spoken with in the same hushed tones as Ravenholm: we don’t go there any more. Then there’s Huygens, the only man-made probe that ever made a landing in the outer solar system. 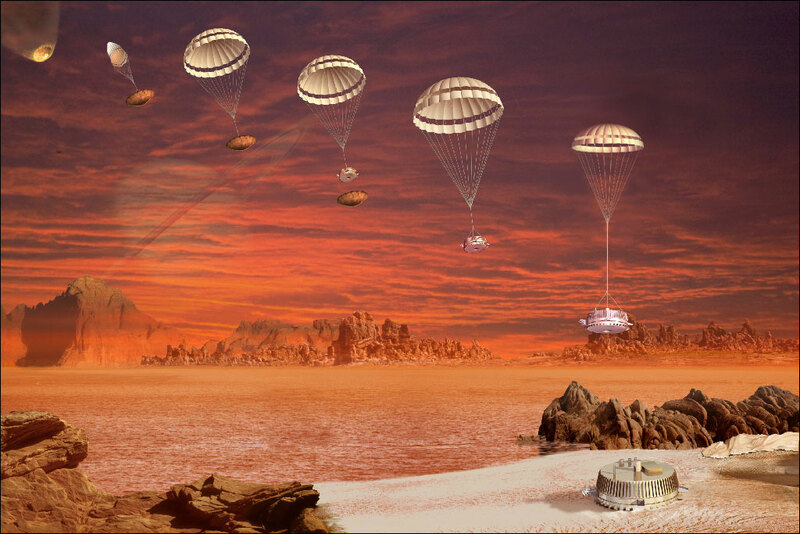 Compared to Venus, Titan is a paradise with a reasonably thick methane atmosphere you can deploy a parachute in, but which won’t crush the probe once it’s down on the surface. Huygens only transmitted for about two hours; however, it was a probe on a budget and that’s all it was designed to do. The only complication facing Huygens was the fact that it landed on a “shoreline” adjacent to a large dark area that may or may not have been a huge ocean of hydrocarbons. 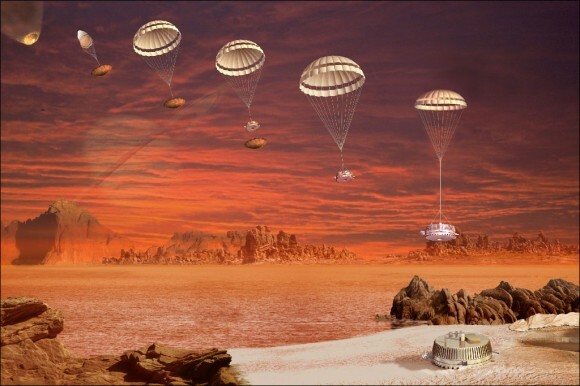 If it had been an ocean, and if Huygens had landed in it, it would have been an even shorter mission than intended; while the possibility that the probe might land in a liquid environment had been considered, it was only designed to transmit for a few minutes before sinking below the sub-zero waves. We’re pretty good at landing stuff in oceans thanks to the space race, though, to the point where it’s actually the least of our worries as long as we can plan for it. In fact, as the Venera Venus landers show we can land probes pretty much anywhere with a solid surface as long as we know about the environment they’re going to be landing in. Again, this demonstrates the iterative nature of spaceflight; you need to make a lot of failed attempts in order to gather the data you need to make the successful one. Even smashing a probe into a planet a la Luna 2 yields some useful data in that it proves you can hit the target. Luna 9 just landing on the moon was of great interest because it proved the moon had a solid surface you could walk around on (it was thought that the dust on the lunar surface might be so deep it would effectively constitute quicksand). So really there are no true failures in probe spaceflight. Smashing probes into celestial bodies. Fun AND useful. 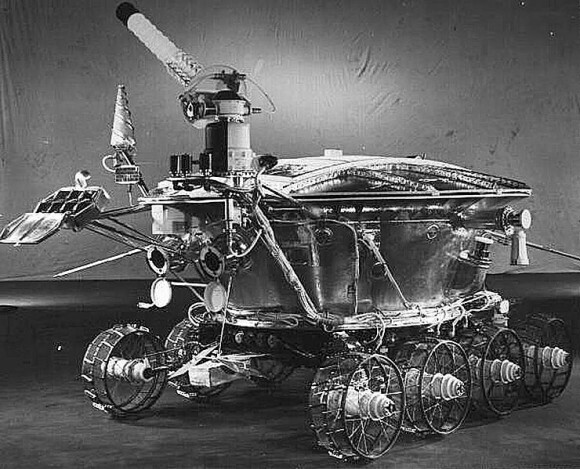 I had no idea the Russians landed a rover on the moon. I’m learning! I too, had not realized that the soviets ever got that ahead. I always assumed they had stopped after the U.S landed and Korielev’s partner took over the space program. The Soviets had their space program slightly gutted after the Americans got the Moon, but they devoted what resources they did have left on doing practical, non-photogenic work like Lunokhod, which didn’t make news headlines because landing a robot on the moon while the Americans were landing people on it wasn’t seen as a big achievement even though all subsequent space exploration has been done by robots. Mir is the same: the Russians have more experience with long-term space survival and endurance than anyone thanks to Mir, but it’s almost forgotten these days because the ISS exists.